As a girl growing up with the Rocky Mountain National Park quite literally as her backyard, Kim Shaklee acquired an intense love for nature and wildlife. Her artistic development was strongly influenced by her father, a talented artist himself, and her grandfather, a veterinarian. Kim attended Colorado State University and majored in forestry. Instead of pursuing forestry as a career, she has combined her education and life experiences in her pursuit of fine art. Kim’s work has been shown at numerous national juried exhibitions. 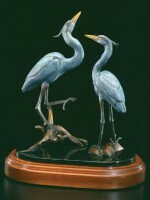 Some notable showings include the prestigious National Academy of Design, New York; Animals in Art, Louisiana; Sculpture in the Park, Colorado; The Salmagundi Club, New York; Audubon Artists Inc.; Catherine Lorillard Wolfe Art Club, New York; Foundation for North American Wild Sheep, Nevada; Texas, Wildlife West Art Festival, California; and Natureworks, Oklahoma. 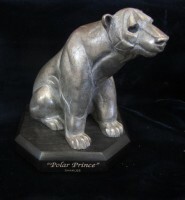 Kim was the recipient of the Maritime Environmental Wildlife Award at the 1994 and 1995 Maritime Gallery at Mystic Seaport’s International Marine Art exhibition, and also recently received an Award of Excellence. Kim is currently the President and Fellow of the American Society for Marine Artists, ASMA.